The Fellowes ìPowershred 220î strip-cut shredder is for light-duty office applications. Includes a separate slot to shred CDís. 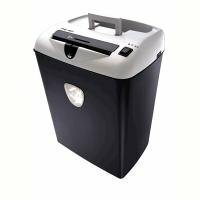 Small yet powerful, this shredder features a 10" entry width and easily handles all standard size office documents. Electronic automatic start/stop provides convenient, one-handed operation. 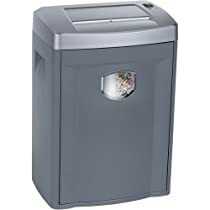 Other features include automatic stop (with indicator light) when bin is full and automatic shut-off when door is ajar. Shreds up to 14 to 16 sheets per pass into 1/2" strips at a speed of 24 feet per minute. Heavy-duty quiet motors allow for extended shredding cycles. Waste container capacity 18 gallons. The Fellowes PS60CC ìPersonal-size Paper Shredding machineî features a 9" entry width and can handle all standard-size office documents. Shreds seven sheets per pass (25 to 50 shredding passes per day; approximately 350 sheets total) into confetti-like particles (5/32" x 1-3/8"), resulting in greater security and less frequently emptied wastebaskets. Exclusive ìPowershredî cutting system accepts staples, credit cards, and small paper clips. Heavy-duty quiet motor allows for extended shredding cycle and less downtime. Clear window in 6-1/2 gallon wastebasket allows user to see when the basket is full. 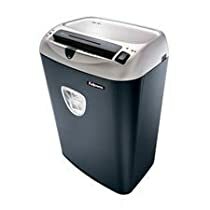 Silver/Graphite; 8" x 14-1/4" x 10"
The Fellowes PS70 ìPersonal Seriesî Deluxe Desk-Side Shredder includes a unique integrated stand with separate wastebasket that allows the removal of the basket without lifting the shredder. Strip-cut shredder features automatic start/stop, 1/8" hp motor and a 9-1/2" throat. This PS70 model shreds up to 12 sheets of paper at a time. 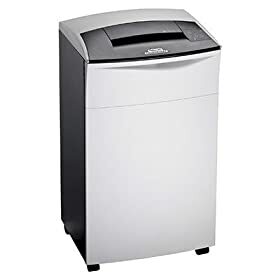 Dove Gray; 16-1/2" x 11" x 20-1/2"
The ìPersonal Seriesî Deluxe Desk-Side Shredder offers cross-cutting and includes a unique stand that allows removal of the wastebasket without lifting the shredder. Features automatic start/stop, 1/8" hp motor and a 9-1/2" throat. This PS80 model shreds up to 7 sheets of paper at a time into 5/32" x 4/5" unreadable, confetti-like particles.